Viducon held its 1st Panopto seminar for Administrators and Superusers, on the 14th of Feb 2017. The seminar took place in Copenhagen, where participants both from Denmark and Sweden attended the event. It was an interesting blend of participants, who came from the educational, private and public sectors. The goal of the seminar was to assist with the implementation process of video as part of e.g. teaching and employee training, by using Panopto. The event covered mainly admin and technical aspects and topics, such as integration possibilities, implementation process, admin role, recommended hardware, room installations, data security and user cases. The purpose of the event was to cover the many possibilities which Panopto offers, while at the same time, give Panopto users in Denmark and Sweden, the possibility to network, share their experiences and most importantly get inspired. Panopto’s representatives, Denis Staskewitsch, Regional Manager, and Ulus Isa, Senior Solutions Engineer, arrived from London to present Panopto’s organizational structure, a number of user cases, and the technical aspects of Panopto’s video solution. Also presenting, were two guest speakers from Danish colleges, Carsten Storgaard, IT and E-learning consultant from Cphbusiness, and Lars Olsen, Project Manager and student advisor, from University College Northern Denmark (UCN). Carsten Storgaard presented, in a very creative way, how Cphbusiness is implementing Panopto, and some inspiring user cases, which are quite different to the traditional use of video in education. Lars Olsen presented the advanced lecture room setup at UCN, where Panopto’s software is capturing 3 cameras, the Smartboard’s output and PowerPoint, all in one recording. Quite a setup! Viducon’s CTO, Felix A. Bar, went through and advised on recommended technical setups such as audio, video quality, permanent installations, remote recorders and hardware. Showing how hardware can be complementary to Panopto’s software solution. Last to present was Viducon’s CEO, Yaron Schwartz, who talked about the use of Panopto and growth in the Danish and Swedish markets. Later he was joined by Denis Staskewitsch, where they went through Panopto’s roadmap and talked about Panopto’s global community. The seminar was closed with a Q&A session, coffee and some delicious cupcakes. The 1st Panopto seminar in Denmark, was highly successful, with more participants than first planned for, and the participants were happy for the opportunity to talk with Panopto representatives, learn, get inspired, and network with other Panopto users in Denmark and Sweden. As there was much interest shown in the seminar, Viducon is planning to organize such events again in the future, covering different topics, which would be requested by Panopto users in Scandinavia. Viducon would like to encourage Panopto users in Scandinavia to join the group ‘Panopto Brugere I Danmark’ (‘Panopto Users in Denmark’) on LinkedIn, where Panopto users can share their experience, start a discussion, ask questions and write some suggestions. Viducon thanks all guest speakers and participants, and is looking forward to seeing you at its next event! SEATTLE, WA — (Thursday, January 26, 2017) — Panopto, the leader in education video platforms, today announced it has been named one of two preferred partners by the California State University system. Through this partnership, any of CSU’s 23 campuses can easily acquire Panopto’s all-in-one platform for video content management, lecture capture, and flipping the classroom. The CSU Master Enabling Agreement makes Panopto one of two preferred campus video solutions for the entire CSU system, and the only platform providing both video management and video capture as an integrated, software-based solution. For ten years, Panopto has been a leader in higher education video, with the easiest-to-use video portal, integration with all major learning management systems, flexible recording tools, simple deployment, and top-rated support. Already among the CSU campuses using Panopto today are California State Long Beach, California State East Bay, and San Jose State. The California State University is the largest system of senior higher education in the country, with 23 campuses, 49,000 faculty, and 474,000 students across the state, and awarding more than 105,000 degrees annually. Created in 1960, the CSU provides high-quality, affordable education to meet the ever changing needs of California. For more information, visit the CSU Media Center. Panopto helps universities and businesses create searchable video libraries of their institutional knowledge. Since 2007, the company has been a pioneer in video content management systems, video capture software, and inside-video search technology. 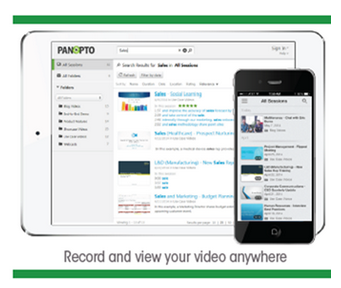 Today, Panopto’s video platform is the largest repository of expert learning videos in the world. Headquartered in Seattle, with offices in Pittsburgh, London, Hong Kong, Beijing, and Sydney, Panopto has received industry recognition for its innovation, rapid growth, and company culture. For more information, visit www.panopto.com. The Seminole State College in Florida has rolled the Panopto Platform out across its four campuses thus supporting almost every kind learning experience at the college. The Panopto platform supports the flipped classroom model. This means that professors can record pre-class videos and include everything from whiteboard drawings, lab experiments and traditional slides. With the analytics function, the professors can get an insight in what part of the topics mentioned and covered in the video are the most challenging for the students. This means that they have an insight to improve their own teaching methods. The Seminole State School of Public Safety’s Emergency Medical Services program has used Panopto to help in providing EMS education for the full-time first responders. To make sure that every member of the crew got the same amount of training, they recorded and live-streamed a class. This meant that those who couldn’t participate in person in the class could get the same training. Those who couldn’t participate in either the live-stream or the class itself could watch the video on demand, as the recorded class was uploaded to the LMS with Panopto. Further on, the faculty now records every training and simulations. This means the students have a chance for debriefing and note their weaknesses and strengths. As Panopto have several features to support watching videos on demand, Seminole College also facilitate the usage of Panoptos mobile apps for IOS and Android. This means the students both can participate in the courses while not on campus and use it to record presentations with the audience in view on the mobile device. Once completed, the video is uploaded by Panopto to the student’s designated folder and the instructors can use it for grading and feedback. The Seminole State College have therefore taken advantage of many Panopto Platform features. If you already find it interesting to try out Panopto, you can contact us and try it out for yourself. 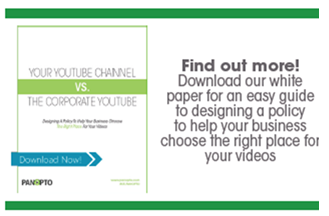 There is much to consider when choosing a new video platform. Earlier we wrote about how Yale had chosen Panopto over Kaltura and how CBS (Copenhagen Business School) had done the same. In Florida, the Seminole State College had been using eLearning for over a decade and saw how video had become a more regular part of the students’ learning experience. With over 30,000 students, Seminole State College is the eighth-largest institution of the College System in Florida. They began to face a lack of standardization and looked to other video platforms to find a new solution. The first real test of Panopto came with recording of the Symphonic Community Band’s concert. They used Panopto to live stream the event as a longtime member of the band had died only days prior to the event, The Seminole State College Music Department dedicated a scholarship in the member’s name. Because the family of the honored member couldn’t participate in the event, they watched the webcast instead. This success meant that the school began to roll out Panopto across the campus. One of the features most used was the Remote Recorder. With this feature the instructors could schedule recordings for the whole semester and let Panopto handle recording, streaming and uploading. They only had to turn it on and off. Want to try Panopto yourself? The use of video on campuses for teaching and learning is growing at an astonishing rate. Increasing numbers of students are requesting that professors record their lectures, driving the growth in adoption of lecture capture at universities around the world. However, the use of video on campus isn’t restricted to lecture recording. Teachers worldwide are using video to improve the learning experience through blended learning scenarios, flipped classrooms, student recording, campus event webcasting, and more. Given the demand, learning technologists, faculty, and IT administrators are now faced with finding the right online video platform for their educational institutions. But what factors should they consider when evaluating solutions? One of the top considerations that our customers have when evaluating video platforms is that it must be easy for everyone to use, regardless of technical ability. Viewing, uploading, capturing video, live broadcasting, and managing video content all must be intuitive to learn and simple to perform. Another critical factor in choosing a video platform is the ease and depth of integration with the school’s existing technologies. The educational video platform should offer the widest range of compatibility with the technologies already in place at your institution. Ready-made integration modules for LMSs such as Blackboard, Moodle, Desire2Learn, and Instructure Canvas enable seamless course provisioning from within the LMS. Support for existing identity systems such as Active Directory and SAML also ensure single user sign-on support and hassle-free user management. For IT administrators, one of the biggest draws of implementing a video content management system (VCMS) is the ability to consolidate all video content from various campus servers and manage it from a single, centralized resource — not unlike a “Campus YouTube.” Not only does having a central video resource streamline the user experience, but it also helps decrease IT support and management costs — particularly if a cloud-based video platform is chosen. Device compatibility affects the consideration of video platforms in two ways. First, the video platform must offer “plug-and-play” compatibility with the widest range of capture hardware and devices. 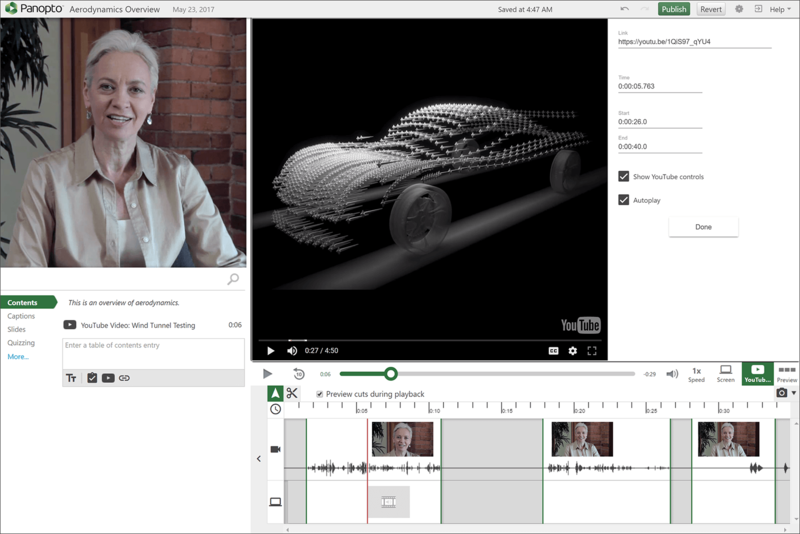 From webcams to digital whiteboards, video-enabled microscopes to document cameras, the platform should be able to recognize and support recordings from nearly any capture device that can be plugged into a PC. Broad device support ensures that IT departments won’t have to worry about whether the school’s existing capture hardware is compatible with the new system, and lets professors concentrate on teaching rather than technology. Second, the platform must be able to deliver video content to the widest range of devices, from laptops to smartphones to tablet computers. The growth in popularity of mobile devices on campus has only strengthened student expectations of being able to access course materials wherever and whenever they need. Therefore, videos must be able to be accessed from any device. To this end, the platform must be able to take videos that can be uploaded in any number of file formats and transcode them into the appropriate file types that can be viewed on all types of devices, regardless of form factor or operating system. Unlocking the full power of a campus video platform means enabling students to search for and find the specific parts of a video that can help them revise for exams, or revisit topics that were difficult to understand during class. However, hunting and pecking through video timelines is an inefficient and time-consuming way to search for specific content. Students should to be able to quickly find the information they’re looking for. Therefore, comprehensive video search functionality is a top priority, especially when lecture videos can often last an hour or more. Leading educational video platforms use Automated Speech Recognition (ASR) and Optical Character Recognition (OCR) technology to index every word spoken or appeared during a video in addition to ingesting PowerPoint/Keynote slide content and user-generated notes, so that viewers can locate specific pieces of information, then access the relevant portion of the video with a single click. The availability of analytics data is a priority for both IT administrators as well as instructors. IT staff require administrative analytics, consisting of practical information on system performance such as server health and network usage. On the other hand, instructors are particularly interested in learning analytics, which include statistics on audience engagement and viewing activity (e.g. who stopped viewing and when). This information helps professors personalize video learning modules based on how their students are engaging with the content. Finally, IT administrators often inquire whether recordings can be scheduled in advance, so that professors don’t need to spend precious pre-class time fiddling with technology to set up a recording. With automated recording, administrators are able to control all the video recordings and live webcasts currently taking place at the school from a single web browser. Recordings can be remotely scheduled on a one-time basis or for recurring events, beginning and ending at any time specified by the administrator. As soon as the event or lecture ends, the recording is automatically uploaded into the school’s video library, where it is transcoded and made available for students to access on-demand. Overvejer din organisation en videoløsning? Brugen af en videoløsning i undervisningen er meget udbredt og flere universiteter har allerede indkoproeret det i deres forelæsninger. Panopto og Kaltura er dog ikke ens og der er væsentlige forskelle mellem systemerne som man bør overveje før man vælger det ene system fremfor det andet. Hvor Panopto i højere grad er designet til uddannelsessektoren med unikke pædagogiske funktioner er Kaltura i højere grad er lavet til mediebranchen. Konklusionen på rapporten var, at Panopto var den platform der bedst opfyldte kriterierne. Dette betød at Yale i August 2016 underskrev en kontrakt med Panopto og fik konverteret over 10.000 timers videoindhold fra Kaltura og Echo360 over i Panopto. Aftalen er et tegn på at Panopto er bedst designet til at håndtere et universitets behov for videoløsninger. med systemets tilgængelighed, der giver både underviserne og de studerende mulighed for at skabe indhold, har Panopto sikret at alle kan bruge systemet og dermed sikret at det kan løse langt de fleste behov. Copenhagen Business School (CBS) har benyttet Kaltura i over 4 år og Panopto i snart 3 år. I 2015 lavede CBS en lignende undersøgelse som Yales, hvor man stillede Panopto overfor Kaltura, for at se hvilken af de to systemer man skulle fortsætte med at benytte sig af. CBS kom også frem til at Panopto bedst understøttede de krav de stillede til platformen. Som med Yale, er en vigtig fordel var at alle studerende og undervisere selv kan skabe indhold. Da man samtidig lagde til grund at udviklingen af Panopto er længere fremme end Kaltura, viser det at der er en klar forskel mellem de to systemer. Den bedste måde at undersøge hvad der bedst fungerer for din organisation er selvfølgelig at prøve det selv. Det er en god idé at få testet mulighederne og danne et overblik over hvad Panopto kan og hvordan den kan støtte jeres fremtidige læringsmetoder. Hvis du vil prøve Panopto kan du kontakte os på nedenstående link. Assistant Professor Till Winkler has been intensely using video as part of his teaching at Copenhagen Business School (CBS). He is one of an increasing number of lecturers at CBS who use video to support their teaching by recording lectures, flipping the classroom, and creating a more blended in-class and online learning experience. Till shared with us some of the lessons he learned on his journey of using video in teaching. These experiences may inspire other readers on how video technologies can help adding quality and flexibility to teaching, as well as enable better control and allow the design of courses that address the increasing quality and efficiency pressures in higher education. This not only helps the ones with special disabilities, but also addresses the various learning needs of the students. At first, he arranged with the video team at CBS to set up the equipment and record his guest speakers. After he saw how easy it was, he simply borrowed the recording equipment and recorded all subsequent talks himself, without the need for further assistance. Video recording was the perfect solution that could save his guest speakers’ time and maintain their contribution to his lectures. That was one of the motivations for him to invest his time into the development of a blended course which included several sessions provided fully online. In the future, he plans to use these lectures to “flip” the classroom and thereby save valuable classroom time for more discussion and interaction. The “theatre” will then be left for the students to watch at home before and prepare each session. Therefore, using video not only solved some of the perceived inefficiencies mentioned above. It also enabled Till to design and track the learning progress of each student by the lectures that they viewed and the online activities they participated in. Disregarding the fact that it took quite some time to script and record the lectures, he estimates that this effort will pay off in the long run. At least in the case of his course, he feels it’s the right way to go for both him and the students, to create his material once with a high level of quality and then continue to use and reuse it—while improving it gradually—over the coming years. He speculates that this might have happened because students feel the proximity of their professor, like in a “one-on-one” session with their teacher while watching the recorded videos. In contrast, the classroom environment can cause distractions, when students are sitting in a classroom, leading them to feel less engaged in the lecture. How Can Other Teachers Benefit from Using Video? Professor Winkler mentioned that during parts of the semester in which his course ran he was abroad for a research stay in the U.S. Due to the online format, however, this did not affect his teaching at all. Being able to record his lectures and provide them to the students in Denmark in an asynchronous manner gave him the flexibility needed to fulfil his teaching obligations, while not having to compromise on his research activities abroad. This is one of the great opportunities that video lecturing offers to researchers that teach in higher education. Through watching the videos at home, students get the opportunity to study these heavy parts at their own pace and at the time and place that is convenient for them. If you’re interested in trying out Panopto, the video solution used by Till Winkler at CBS, please, contact our team to receive a personalized demo, or sign up for a 30-day trial. Viducon is happy to invite you to our business partner’s Panopto, annual one-day conference. The conference will be taking place in central London on Wednesday 9 November 2016. The event theme this year will be ‘video from every angle’. The conference will bring together delegates from universities, colleges and schools to share best practice, network and learn about all the latest developments in video and multimedia content. There is no charge to attend. If you have an idea for content you’d like to present and you want to discuss it, please email Rebecca Avery: ravery@panopto.com. quality is so poor that it becomes difficult to pay attention to the speakers or information being presented. When recording a presentation or preparing for a webinar, many people spend most of their effort making sure the video is perfect, and tend to overlook simple audio settings that can make or break the quality of a recording.Good audio quality is a critical component in ensuring your viewers stay engaged and don’t miss any part of your presentation. High-quality audio also improves the accuracy of speech search within your videos, making it easier for viewers to find and fast-forward to precise words or phrases mentioned by a speaker. Here are 5 simple tips that can make sure the audio in your presentation recordings are as clear and easy to hear as possible. 1. Remove as much ambient noise as possible. In order to get the best sound quality out of your microphone, you need to be sure that you minimize any ambient noise in the room. Even seemingly innocuous room items like a spinning ceiling fan, which may be practically silent to you, can cause distracting background noise in your recording. Before you start recording, make sure that any fans are turned off and any office machines (such as a fax machine or printer) that could interrupt you are unplugged. If possible, we also recommend positioning your microphone away from your computer. PC fans can sometimes increase in speed due to hardware usage during a recording. 2. Choose the right equipment. In many cases, your laptop’s onboard microphone or the microphone on your webcam will be sufficient if you’re recording in a small room with little ambient noise. On the other hand, if you’re in a conference or auditorium setting, you may want to consider using a uni-directional microphone. A uni-directional microphone ensures that only the sound from one direction will be picked up. By contrast, an omni-directional microphone will pick up sounds from all directions — which would capture distracting sounds from other people in a classroom or a common work area. Two of our favorite microphones are the Blue Yeti and the Sony ECM-AW3. Both of these mics offer great sound quality at an affordable price. If you’re using Panopto, our broad device support ensures that whichever microphone you choose, all you need to do is plug it in. We take care of the rest. 3. If you choose to use music, leave it to the beginning and end of your presentation. There’s nothing more distracting than having to listen to a music track being played underneath your vocals for an extended period of time. If you’d like to incorporate music into your presentation, limit the use to 5-6 seconds in the beginning and end of your video. Using music in this way can help introduce and close your session for your viewers. However, be mindful of copyrights when using music for presentations. To keep things simple, we suggest using a stock audio site like AudioJungle or the audio section of iStockPhoto, where inexpensive royalty-free music clips can be purchased. 4. Keep an eye on your input volume. To make sure that you’re recording at the right volume levels, it’s important that you pay attention to the input volume meter in your recorder. If you’re using the Panopto software for Windows, the input volume is on the right side of the screen; if you’re using our software for Mac, the input volume can be found near the bottom of the recording window. As you record, you’ll want to keep your volume in the green zone. If you find that your voice is constantly metered in the red zone, your input volume is too high and your audio will be “clipped,” resulting in distorted audio during playback. 5. Don’t forget to sound check! Although this step may seem to be a no-brainer, it’s one that many people miss. When you’ve finished setting up your presentation recording area and are almost ready to start, take a few minutes out to make a quick test video. It doesn’t have to be complicated — simply record yourself saying a few brief words. Once you’ve completed your test recording, Panopto will automatically upload it into your organization’s video library, where you can play it back to make sure that your audio and video quality are exactly as you want it. Making a test recording gives you the opportunity to make any necessary quick adjustments before you record your actual video, sparing you from any surprises in your final recording. Do you have any other tips to ensure that your audio quality is crisp and clear? We’d love to hear from you in the comments. If you’re interested in learning more about how Panopto can help you improve elearning and communication at your business or university, contact us here. As teachers continue using different technologies to improve learning both in and out of the classroom, video is quickly becoming their medium of choice. According to a 2011 article in College Teaching, versatility, accessibility, and the breadth of content offered by online video creates opportunities to enrich course content and improve student engagement through activities and discussion. Naturally, here at Panopto we think video is one of the best ways to communicate ideas and stimulate discussion in the classroom. Here are some of our favorite ways to enrich the blended learning experience through video. The fastest growing application for video in education is the flipped classroom, also known as “inverted teaching.” In flipped classroom scenarios, students watch a recorded lecture at home before class, then spend their time during class applying the lecture material through discussion or exercises guided by the instructor. Many professors find that flipping their classes creates a more interactive, participatory learning environment, and students come to class better prepared to discuss the topic or ask questions. At Butler University in Indianapolis, where professors have been using Panopto since 2010, flipping the classroom has improved the quality of in-class discussion and has led to improved exam scores. Teachers don’t have to always be the ones in front of the camera. Some universities are turning the tables by using their video learning platform for student skills practice and assessment. At the University of British Columbia’s Sauder School of Business, students in their Business Communications course use Panopto to record their presentations, then play the videos back to critique their performances. In addition to flipping classes, professors at Butler Universityassess students in their Physician Assistant program through video. Students record themselves interacting with standardized patients using an iPad or laptop, and those recordings are used in turn by their professors, who offer feedback on their performance. Video tutorials for viewing outside of class can help shed light on difficult topics that require a little bit more practice, or offer additional information for students that want to deepen their understanding. They can also be used to prepare students for an in-class lecture that have less experience with the subject at hand. Video learning platforms can make it easy for teachers who want to quickly and easily create mini-lectures or tutorials. With Panopto, all that’s needed is to hit the big red RECORD button, and Panopto automatically records the contents of the screen and indexes slides, other on-screen content, and the teachers spoken words for search. This functionality is particularly well-suited for demonstrating software, such as in this video from the University of Birmingham, demonstrating how a particular program should be used for an upcoming assignment. To learn more about today’s modern lecture capture technology, contact us here. In less than a decade, lecture recording technology has shifted from novelty to necessity in universities around the world. Study after study now finds students expect their institutions to invest in more — and more sophisticated — lecture capture tools in order to facilitate better learning experiences. Adding to the chorus today is new research from the University of Colorado Anschutz Medical Campus. After bringing Panopto’s lecture capture video platform to its classrooms, CU Anschutz invited all 1st and 2nd year students from the school’s Dentistry, Nursing, Pharmacy and Physical Therapy programs to weigh in on the value of the technology. In their responses to the survey, the students at CU Anschutz joined their peers around the globe with an overwhelmingly positive view of the value and importance of having lecture recordings available as study aids. Along with confirming the value of providing lecture recordings for students, CU Anschutz also queried its students as to what lecture capture feature they valued most. The school’s findings suggest that today’s students have moved beyond the first “anything is better than nothing” mindset that characterized most early lecture recording toolsets, and have now come to rely on more advanced features to help make the video content an even better study aid. In today’s market, there is no shortage of potential options when it comes to lecture capture platform features. So which capabilities which made the most difference to the students at CU Anschutz? Video content has always been notoriously difficult to search. Even today, most video platforms, even giants like YouTube, can only search by a recording’s title, tags, and description — a small fraction of the actual content of a video. And while that small amount may be enough to help the next latest 2 minute cat video go viral, today’s students have a greater need to meet. The sheer amount of information shared in a lecture — recorded in videos that commonly run 60, 90, 120 minutes or more — mean that today’s lecture capture platforms need to go above and beyond the old standards of video content search, and index as much of the actual content of the video presentation itself as possible. To do just that, CU Anschutz relies on Panopto as the university’s video platform. 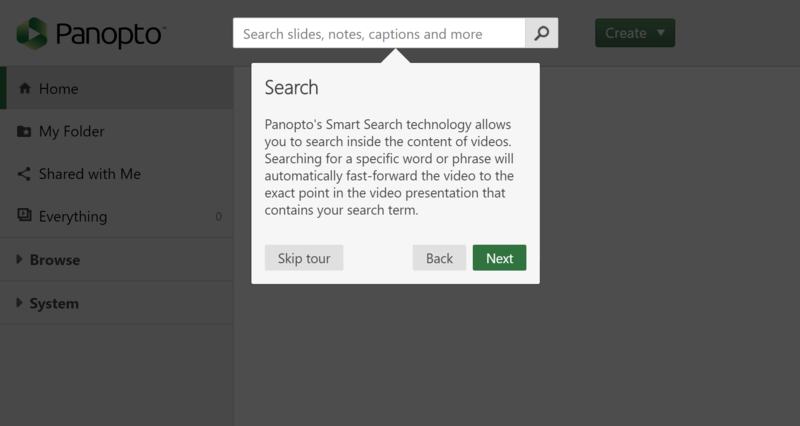 Panopto’s Smart Search video content search capabilities index every word spoken, every word shown on-screen, every word included in presentation slides, and every word included in any added transcriptions, for every recording in the university’s Panopto video library. When students search, Panopto finds every moment their keyword occurs — and gives them the option to instantly fast-forward right to the relevant moment. And according to the research, students have found that comprehensive video content search is absolutely essential. CU Anschutz reports the vast majority of students consider search a highly valuable feature that adds immensely to the utility of the lecture recordings. While search enables students to instantly seek out a particular moment for review, another common use students have for recorded lectures is simply to re-live the original classroom session. Yet, as students’ lives are increasingly pressed for time between readings and papers, athletics and jobs, student groups, family visits, and spending time with friends, finding an available hour or two just to re-watch a lecturer’s presentation can be a difficult proposition. Variable speed playback capabilities offer an easy solution to the dilemma. With Panopto, CU Anschutz’s students can choose to watch any recorded lecture at regular speed, or to change the playback speed — up to twice as fast for a quicker review, or down to half speed to make it easier to follow along with complex concepts or when the speaker is difficult to understand. For students at CU Anschutz, variable playback speed was the single most valued lecture capture feature — more than 4 in 5 rated the capability as highly valuable. The common stereotype of today’s students is that they come from a connected generation that is always online. And while there can be little doubt students today spend a significant amount of their time working, playing, and interacting online, their connection to the internet isn’t quite as permanent as it may seem. Be it on the bus, in a break room, outside on the quad, in a parent’s house, or in countless other data-less sites, there are still many places in the world where students won’t have a solid connection to the web — and thus, are often unable to access resources like lecture recordings online. Here too, however, a new lecture capture feature can come to the rescue. For CU Anschutz, Panopto allows every lecture recording to be downloaded as a video podcast that students can save to their smartphones, tablets, or laptops and watch on-demand from anywhere, whether or not they’ve got a wifi signal. Students at CU Anschutz raved about the flexibility video podcasts offer for enabling personalized on-demand learning from anywhere, with more than two thirds listing the feature as highly valuable. Along with the features that made lecture capture most useful, the University of Colorado Denver also heard students loud and clear when it came to the simple value of lecture capture as part of the learning experience. After rolling out Panopto on campus to 95% of its students, the majority of students found the technology was “extremely useful” for study and review, and all but a handful saw at least some value in the video. So successful was the technology, it even made an impression on the students who didn’t get a chance to use it. Of the 5% of CU Anschutz students that didn’t experience a recorded lecture, more than 90% reported believing lecture capture would have been a useful addition to their unrecorded classes. And notably, while a common concern among academics is that offering recorded classes will cause a spike in classroom absenteeism, the vast majority of CU Anschutz students reported that for their own use, lecture capture was simply an enhancement to the classroom enhancement, not a substitute for it. More than 9 in 10 reported that availability of lecture capture had little to no impact on their attendance. Lecture capture technology is quickly becoming a student favorite and an essential resource. The results found at CU Anschutz follow those seen by Georgia Tech, Newcastle University, the University of Windsor, and many others. Lecture capture is all about flexible learning. Students come back to recorded lectures prior to exams and finals, and tools that enable targeted content review — for example, keyword search and high speed playback — help students get to the points they need right when they need them. Likewise, as the modern student is often over scheduled and pulled in six directions at once, features that make review possible on their terms — via podcast, or at high-speed — help students fit studying into their lives more conveniently. We’re proud to help the University of Colorado Anschutz Medical Campus provide its students with a truly modern learning experience, and with a study aid that goes above and beyond simple replay to help learners really get to the information they need. No more than a few decades ago, every news story shared the same 26 elements. Notwithstanding a photo here or an illustration there, the vast majority of information published and shared every day was comprised of text alone. To be sure, video newsreels too have played a part in informing the public, but for the vast majority of their hundred year history, video news production was expensive and limited — most newsreels (and their successors, the nightly news broadcast) were exceptionally brief and only covered the basics. For more information, deeper analysis, and a broader range of insights, one could only turn to the text published in daily newspapers. But that dependence on text alone as a means to share information wouldn’t last. This week marks the birthdate of one of the great tipping points in how we share news — the introduction of CNN. CNN obliterated the time constraints that had previously limited televised news, opening the door to investigate information in greater detail. In short order, there would be a dozen imitators, each offering access to information around the clock. The success of the model served to highlight the public’s appetite for information, and helped to ensure that news and information would play a key part of the next revolution in how people share news — the Web. Online, news was shared first as text as newspapers opened digital publications throughout the 1990s, and in short order turned to video as sites like YouTube made public hosting a practical reality. That video use only continues to grow, as social sites embrace recording tools and as live streaming apps make their way to our mobile devices. Now today print remains an iconic part of how news is delivered — but for the most part, now serves only as a summary of what information was shared with video the day before. Yet as the decline of text news may be reaching its natural conclusion, another similar downfall is only just beginning — that of the emails, memos, and other text we share at work. Like the news itself, corporate messages (internal and external alike) have long been text-only affairs. The advent of the A/V department in the 1980s saw a small uptick in video messages, but for the most part those were high-cost projects reserved for special occasions. As it did to news media, however, the Web changed all that. Email enabled more voices to be heard and more ideas to be shared. And YouTube and handheld HD camcorders offered more opportunities to capture events, presentations, and activities and share them with a broader audience. Now today, enterprise video platforms like Panopto are making sharing ideas and information via video fast, easy, and secure for any organization. With just one click, companies can record and share anything from conferences and meetings to proposals, recaps, and best practices. The past hundred years have shown that information moves invariably to where it is best communicated. Early on, the easy distribution of text made the format a clear winner. But now as video becomes inexpensive, simple, flexible, and ubiquitous, the format’s ability to capture visual information alongside text is proving to be the way most people prefer to share and engage with information. To be sure, text won’t be going away. All that video does is empower text to do what it does best — to supplement a presentation and add details where useful, rather than attempting to convey the information in full on it’s own. This week we saw more and more people taking advantage of the power of video to share ideas, discuss information, and make a statement. And in the spirit of passing it on, these are just a few of the ideas shared this week with Panopto’s video presentation software. The 2015 edition of the DEAP Learning and Teaching Conference at Leeds Beckett University reflects the theme of student engagement and the spirit of exchanging experience within an academic community of practice. Join the school for these two lively conference keynote presentations, first from Dr Dilly Fung on re-thinking ‘good’ research-based education, and second from John Goodwin and Saffron Rose offering a Students’ Union perspective on the Higher Education sector and the student experience. Join the Leverhulme Centre for Integrative Research on Agriculture and Health (LCIRAH) for the 5th edition of the organization’s annual research conference. This year’s theme isAgri-Health Research: What have we learned and where to next? The event also marks the launch of the Agriculture, Nutrition and Health Academy, a global research network in agriculture and food systems for improved nutrition and health to serve as a platform for learning and sharing. Dr Jay Wish visits the Henry Ford Medical Group to discuss the latest information on anemia management in End-Stage Renal Disease (ESRD) patients. Iron is vital for specific ESRD treatments to be effective, yet providing adequate amounts of iron may result in significantly higher than normal amounts of iron stored in the body afterwards. Dr Wish introduces the issue, and provides full details on the latest understanding of the issue. Sit in with the students of the University of Denver Sturm College of Law for this discussion of how anyone can get over the nerves commonly associated with networking and public speaking, and come to not only tolerate but truly enjoy the interaction. Covering the basics of small talk to real-world scenarios of how to network with confidence, this recorded lecture is a sharp class that will leave anyone better prepared for their next social event. Finally this week, join the audience at New York Medical College for University Dean Robert Amler’s examination of the state of public health in the United States and the role of the government in healthcare. Amler’s talk digs into the many major issues at that impact public health today, and then looks to local role to extend, supplement, and complement the role of the government. 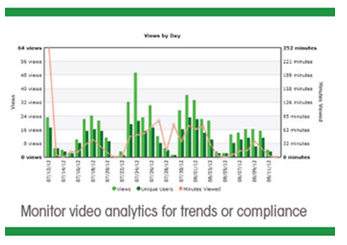 More than 32% of companies surveyed in Forrester’s report allow all employees to post video. Is your company prepared to facilitate this rising demand? 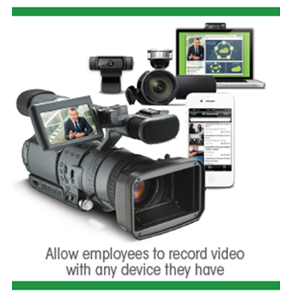 Across enterprises today, using video in the workplace is becoming the norm. For every person in an organization, the application varies: salespeople use video to reach out to contacts and customers when they can’t meet in person, executives use video to communicate earnings results and reorganizations, and employees use it to get up-to-speed and share their expertise with their peers. It seems that, in one way or another, everyone is taking an interest in video. Forrester Research recently published a new report based on references from leading companies that are using enterprise video platforms to accomplish one or more of any number of tasks, including those listed above. What Forrester found was that while interest in video is ubiquitous throughout organizations, implementation is most often fragmented across subsidiaries, departments and job function use cases. Forrester suggests that companies that have piloted video now have an opportunity to develop comprehensive video strategies, leveraging maturing enterprise video platforms. These video content management systems, which can integrate with content and learning management systems, handle recording, editing, storage and distribution of video inside and outside the corporate environment. Enterprises are using video to communicate with a host of stakeholders both external and internal. For each audience group, Forrester found that most customers were both broadcasting live and making videos available on-demand. For customer- and other external-facing video, live video was slightly more popular, while on-demand Corporate YouTube video was preferred for employee and internal-facing video content. With no shortage of social media platforms and white-labelled video hosting services, companies have traditionally distributed their customer-facing videos on sites like YouTube and other hosting services. While public video websites like YouTube are effective for distributing tutorials, advertisements and archived webinars, they present a number of issues for the vast majority of companies that need to protect intellectual property and trade secrets contained within their video content. For internal video, companies often still feel forced to turn to traditional file storage with links from enterprise social and collaboration networks to actually share video content.Modern enterprise video platforms have sophisticated security and permissions tools that make sharing confidential video with select internal audiences possible. Forrester found that even companies operating in highly regulated environments are increasingly moving to these cloud-based systems, allowing individuals to record, upload and even webcast video from any device. A second significant consideration that Forrester identified as a trend for customers deploying enterprise video is the rapidly rising importance of employee access to video recording and sharing tools inside the workplace. Traditionally, video has been the purview of creative and media services departments, with teams of videographers, producers and editors managing the production process from beginning to end. While video hosting solutions sometimes allowed companies to create a portal for their employees to consume video, they typically don’t provide a way for employees to record and share their own video content with their colleagues. Increasingly, corporations are realizing that the production of video need not be kept under lock and key. Employees, who often use video in their personal lives to chat with friends and preserve family moments, are eager to create and share knowledge at work too. And leading companies are embracing this desire. 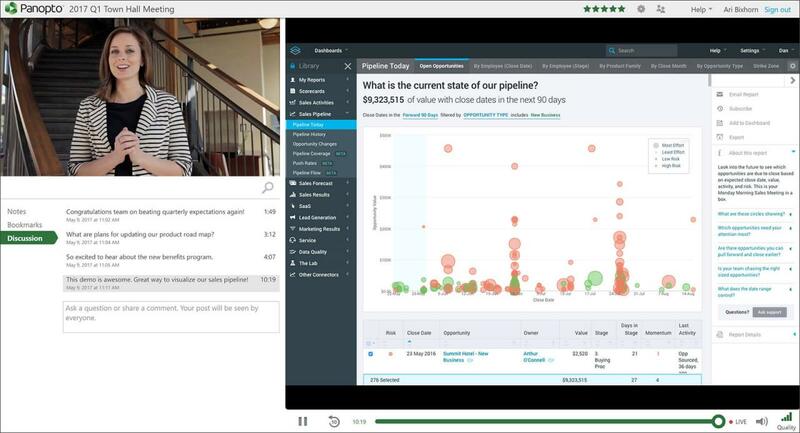 By providing video-based social learning software, corporations can leverage their employee’s expertise in a way that can be saved for later use, whether that’s two weeks or two years later. This is especially effective in capturing the institutional knowledge of outgoing employees and the subsequent onboarding of new team members to take their place. Today, more than 32% of companies surveyed in Forrester’s report allow all employees to post video, with more intending to do so. Companies Are Producing and Consuming More Video Than Ever. How Can IT Professionals Ensure Corporate Networks Keep Up with Demand? Video now makes up more than 57% of all Internet traffic. That’s little surprise to anyone who has enjoyed a movie at home with Netflix or watched a YouTube video while on the go. But video is rapidly flooding corporate networks, presenting a major technical challenge for IT professionals. Gartner predicts that by next year, the average employee will stream over 16 hours of video each and every month. Over the years, vendors have offered no shortage of technologies to help their customers deliver video across an intranet. With fragmentation and long-term uncertainty about the technical delivery of video across networks, it’s no wonder more than 25% of businesses surveyed in the Forrester report had yet to implement a network solution to support the growing use of video. Fortunately, out of the noise of legacy video protocols and the confusion of evolving network infrastructure requirements, a clear answer is emerging. Modern HTTP-Based Streaming presents a series of new opportunities for organizations to use existing network infrastructure for more scalable, cost-effective video delivery, and may just be the key to helping today’s organizations keep pace with the rapid rise of video in the workplace. By holistically examining enterprise video strategy utilizing a video content management system like Panopto, organizations can better manage their institutional expertise, market to potential customers across the Internet, and help salespeople reach their goals, all without sacrificing security or cannibalizing network bandwidth.